RECIFE, Brazil (CNN) -- A Brazilian navy frigate navigated deep waters of the Atlantic on Saturday, carrying the bodies of two men confirmed as passengers of an Air France plane that crashed nearly a week earlier. A search vessel steams past a marker and debris in the Atlantic Ocean on Saturday. 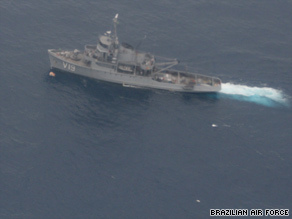 The bodies, discovered along with several items from the plane earlier in the day, were being transported by the Constituicao Frigate roughly 675 kilometers (420 miles) southward to Fernando de Noronha, an archipelago of volcanic islands in the Atlantic Ocean, said Col. Henry Munhoz, spokesman for the Brazilian air force. From there, they will be flown another 355 kilometers (220 miles) to the northern Brazilian city of Recife, Munhoz said. The bodies will be examined by Brazilian forensics experts for identification. Air France 447 vanished over the Atlantic early Monday en route from Rio de Janeiro, Brazil, to Paris, France, with 228 passengers and crew aboard. The discoveries on Saturday provided new-found hope to anxious relatives awaiting news. "When I heard about this accident, they told us there were no bodies, no pieces of the plane," Nelson Faria Marinho, the father of a missing passenger, told Globo News television in Rio de Janeiro. Also found Saturday were a backpack and a leather briefcase containing an airplane ticket with a reservation code, which Air France verified belonged to a passenger on the jet, another air force spokesman, Jorge Amaral, told CNN. The Brazilian navy and air force officials said the backpack contained a laptop, and an oxygen mask also was discovered. The serial number on a blue seat is still being cross checked to determine whether it belonged to the Air France plane. It is not clear where the plane crashed, since ocean currents likely caused the bodies and debris to drift in the six days since the crash. Mary Schiavo, a former inspector general for the Department of Transportation, said Saturday's findings were "hugely significant" not just for the families desperate to recover their loved ones but also for crash investigators. "Even if they don't find anything else they can get some very important clues from the pieces that they do find and from the human remains," Schiavo said. She said investigators would be able to discern if there was an explosion from possible residue on the bodies or other items. Or, if water is found in the lungs of victims, investigators would know the plane went down in tact, she said. "So this is just a treasure trove of information -- very, very important for the investigation," she said. Investigators in Paris said Saturday that the Air France flight sent out 24 automated error messages lasting about four minutes before it crashed. The error messages suggest the plane may have been flying too fast or too slow through severe thunderstorms it encountered before the crash, officials said. They also reported that the airline had failed to replace a part, as recommended by the manufacturer, Airbus. Airbus had advised airlines to update equipment that monitors speed, known as Pitot tubes. The recommendation was a result of technological developments and improvements, an Airbus spokesman told CNN's Richard Quest. The change was not mandatory, and the spokesman would not comment on Air France's failure to follow the advice. But it may be a mistake to place too much emphasis on the Pitot tubes, he added, since the jet apparently was experiencing massive system failures. "I would just like to ask you to bear in mind that all of this is dynamic and there are a lot of question marks," Paul-Louis Arslanian, head of France's accident investigation bureau, told reporters. "We don't know how the aircraft entered the water. We don't know how these pieces of debris entered into the water," he said. "You have to take into account the current ... and the shape of the ocean floor." Schiavo, the former inspector general, said the four minutes of automated signals sent from the plane "was a very long time." "And of course, this is very vital information when you don't have the black boxes," Schiavo said. The four minutes could be the amount of time the plane took to tumble down from an altitude of 35,000 feet, she said. "So that 4 minutes may have actually been the four minutes the plane was falling and it will give clues -- especially with today's finding -- of where to find the bulk of the wreckage and those all-important black boxes," she said. CNN's Karl Penhaul and Helena DeMoura contributed to this report.